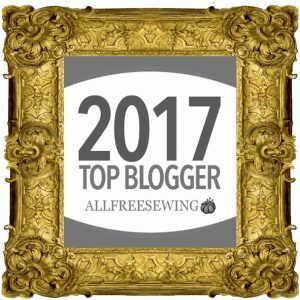 Hello sewists! Time for an Autumn revamp of your wardrobe! 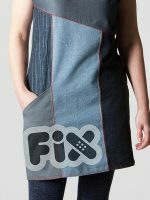 And to help you on your way, here is my latest pattern – the Flippy A-line Dress. It is available here as a completely FREE downloadable PDF and come as a UK size 12 – that’s a US size 8. Don’t worry if this isn’t you – there are tips and measurements for re-resizing it up or down on the Making a Pattern Fit page. It takes 1.5m of fabric. 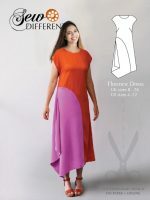 The Flippy A-line Dress has a V neck, a loose fitting bodice with darts at the bust, short sleeves and a slightly dropped waist with an A-line skirt that finishes just above the knee. It is another of my fairly straight up and down shapes, without too much fitting at the waist, that you can throw together without a zip. It’s made here in a fabulous orange and black fabric that was kindly supplied by Sew Essential from their John Kaldor range – cost £10.56 / metre. It has a heavy crepe feel with a slight sheen – the quality is beautiful, hence the reason it hangs so well. 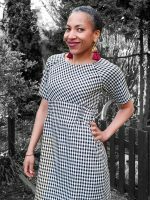 A simple shape like this can take a strong pattern and there are plenty more to be found in this range on their dressmaking fabrics page. There are just a couple of the others I particularly like shown here on the left, but the range is pretty extensive. A-line shapes have definitely taken off, along with the revival of all things 1970 inspired, over the last year or two. I’m thrilled because it has always been the most flattering for a hippy pear-shaped figure like mine. I always keep them above the knee to stop them looking frumpy. I know it’s cool to have them down to mid-calf but it just makes me feel like my mother. • Join the should seams first and put in the darts. • Sew up your side seams and join the three sections of your skirt together. • Then, with right sides together attach your skirt to your bodice. There is a lot of scope for doing something a bit more exciting with your patterned fabrics. With a stripe, or any directional pattern like this blue brush stroke fabric shown left, you can create a chevron effect. 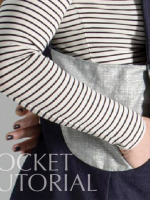 If you turn the pattern onto the bias of the fabric and cut the bodice as two separate pieces going in different directions, (rather than cutting one piece on folded fabric,) the stripe will form a lovely flattering V shape AND you will get all the benefits of a bias fit. 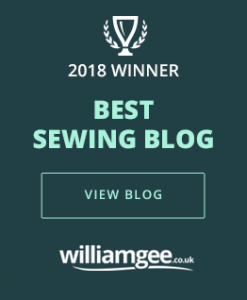 If you haven’t tried this before then just be aware that cutting patterns on the bias does take up more fabric, but its worth it because you get a great, slightly more fitted look but with maximum comfort and movement. 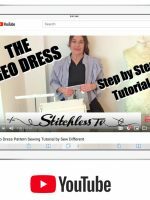 For more info about how and why to cut fabric on the bias, have a look at my pages here which talk you through it. AND if you are really into the diagonal stripes then maybe take a look at another of my free patterns the Chevron Skirt.